Rackworks Rubicon Series Dual 50” Light bar mounts. Each mount is constructed from a light-weight aluminum alloy, designed with our specific overlapping flange concept to work with any existing Rubicon Series rack and End Panel configurations. All mounting holes are slightly oversized and slotted for easy fitment. This concept will allow you to add massive amounts of light to the front of your vehicle turning night into day in minutes! All light openings were designed around Rigid Industry series lights and sizing chart, which many other top brand LED light bar manufactures have adopted. 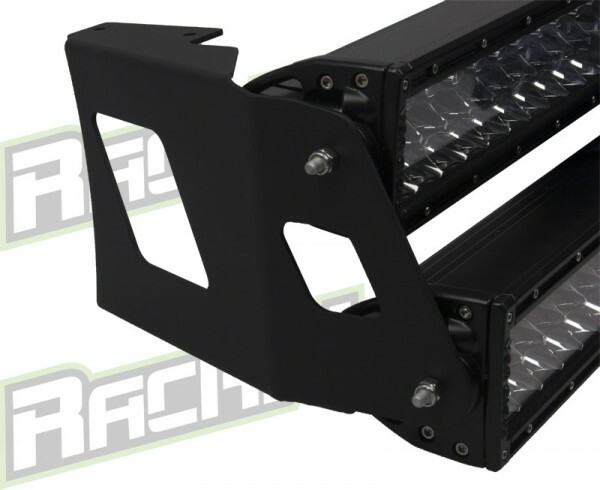 Use our supplied mounts to connect your (2) 50” LED light bar of choice on to our Side Rails (SR). Installation and removal to/from Rubicon series rack allows for quick set-up for your next adventure. It is compatible to our Rubicon Series Standard rack or Eco Series rack. Each mount set comes will all mounting hardware and bracketry necessary. • (1) Part# 1650 mount set. E-series (dual row) SR-series (single row) compatible. • Light bar mounting width (51 1/8” – 51 ½”). • Mount are reversible, (works on front or back of rack). • Slightly oversized and slotted holes for easy fitment. • Laser cut and formed for quality fitment. • Made from 11ga aluminum for a lightweight strong design. • Easy installation to Rubicon series rack. • Little to no wind noise. • Rigid Industires E-series, SR-series, D&D2-series. • KC Hi Lites, C- Series, LZR, and Flex series. • Baja Design, Onyx6 and S8 series. • Vision X, XPR and XPI series. • Our mounts are compatible with various LED light bar manufacturers, please view their data sheets or specification charts before choosing any light bar to ensure proper mounting and fitment. • Compatible with Straight light bars only! • LED lights and light bars not included.